THE WRITING BUDDHA - Opinions | Books | Movies: It's Not Right.. but It's Okay by Anuj Tiwari (Book Review-3*/5) !!! I spent first Sunday of 2016 in completing the 2nd book of my year to start the year well in terms of my reading journey. 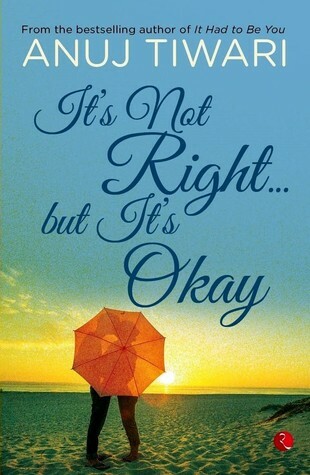 This time I picked up Anuj Tiwari's "It's Not Right... but It's Okay" which has been released on 1st january, 2016 itself. As this is Anuj's 3rd book in 3 years of his writing experience, I had big expectations this time and I had decided to be harsh in case I see no improvements in his writing style. It's time to be little tough on the Indian fiction authors who write under romance genre. They are just writing the same kind of story each time with little twist and claiming it to be a true story. It becomes hard for readers to judge it considering that it's a true story and they start sympathizing with the protagonists without giving consideration to the quality of writing. Well, getting back at the review, Anuj's writing has definitely improved twice than his last book. I witnessed a growth of 200% right from the first sentence to the last. With a flavor of romance, author have tried to tell a mature story with several characters having different background and personalities. The story sounds realistic hence you believe every scene that is been told in several small chapters and start imagining the characters around you. Anuj does justice to the locations he have chosen this time and the characters relate to the places they belong to. The story keeps moving in a flow with some sweet incidents, descriptions of tragic past, cute conversations, romantic Whatsapp chats etc until the last 25% of the book when a twist takes place and the characters start introspecting and believing and disbelieving and crying and resolving their cases to finally getting what they want from life with few exceptions. The transitions that takes place in the story is well handled and you do not feel that the author was doubtful about any part that he was writing. Whenever the locations or the chemistry between the characters gets changed, you do not find a drastic change in terms of writing style or flow of story which makes this book one of the better light reads that you would love to carry with you while traveling or for a single-sitting read. I completed this book within 3.5 hours and it isn't boring at all like previous books of Anuj Tiwari which becomes monotonous after a point of time. This one surely stands out from his last two babies. I give this book a good 3 stars this time and I am sure Anuj is going to get better with each book that he's going to write. The only drawback about this book has been the distraction from the twist even when in the pre-climax part which begins to irritate a reader. Anuj should have handled it properly. Rest, it's a fine attempt.